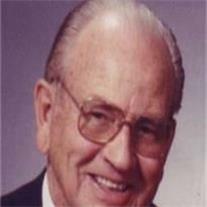 Almo J Tolman, 97, passed away March 17, 2013. He was born June 13, 1915 in Burley, ID. He is survived by Ruth M Edmondson Tolman, who has been his life-long companion of 76 years. They were sealed in the St. George LDS Temple. At a young age he moved to Bell, CA, a suburb of Los Angeles with his family. He was married in 1937 and started working for General Motors Corporation in the late 30’s. In 1956 he was transferred to GM’s Central Office in Detroit, MI, where he was responsible for overseeing quality control problems in the assembly plants throughout the United States. After 40 years with General Motors he retired and moved back to California, residing in Hemet. He and Ruth moved to Mesa in 1984 to be closer to family. Besides his wife he is survived by a son Rodney W. Tolman (Kathryn), Mesa, AZ, and a daughter, Christine M. Heap-Tano of Tremonton, UT. There are 19 grandchildren of which a grandson, Jason A. Tolman passed away 4 years ago at age 27. In addition there are 63 great-grandchildren. He was an active member of the LDS Church, serving in various Priesthood leadership positions. Visitation is Sunday, March 24, 2013 from 5-7 PM at Bunker’s Garden Chapel, 33 N. Centennial Way, Mesa 85201. Services are Monday, March 25, 2013 at 11 AM, preceded by a visitation at 10 AM at the LDS Kimball Stake Center, 1266 S. 32nd Street, Mesa 85204. Interment will follow at the City of Mesa Cemetery.